UNESCO commemorated the bicentenary of Mozart’s death in 1991 with a concert and gala evening at the Sorbonne in Paris and the presentation of the first Mozart medal to the soprano Elisabeth Schwarzkopf, one of the greatest interpreters of the Austrian composer’s creative genius. 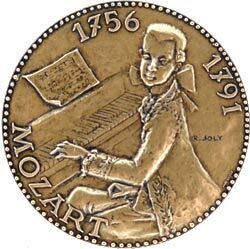 Designed by Raymond Joly, the obverse shows the young musician at the keyboard, with the inscription Mozart 1756-1791. 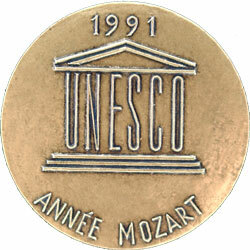 The reverse has the UNESCO logo and the inscription Année Mozart 1991 (Mozart Year 1991). Mozart was one of the most significant and influential composers of Western classical music. He started to play the piano at the age of three, began composing music before he was five years old and created at least 600 musical compositions. He is the author of religious masterpieces, operas, 41 symphonies, as well as several concertos, sonatas and chamber music. He travelled extensively through Europe before becoming Concertmaster in Salzburg from 1772-1777, and then moved to Vienna as a free artist where he married Constanza Weber and resided until his death in 1791. The Permanent Delegation of Austria to UNESCO requested that UNESCO should be associated in 2006 with the 250th anniversary of the birth of Wolfgang Amadeus Mozart. The General Conference in 2005 adopted a resolution to this effect.